This work tray is large enough to hold tools and a gallon of paint. This work tray can hold up to 50 lbs. 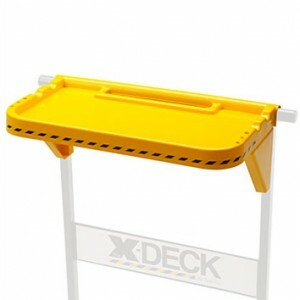 This work tray attaches to the handrail and fits over the smaller work tray. There is a raised lip to keep tools or loose nuts and bolts from rolling off. This work tray keeps what you are working with right beside you, so you dont have to keep your tools by your feet.